“Papwa” Sewsunker Sewgolum was born in 1930, into a family of poor sugarcane labourers in Natal. He started working at an early age, and as a young boy, Sewgolum took to imitating the golfers he had seen on a nearby golf course by hitting a golf ball with a Syringa stick. Later, Sewgolum was able to practice his childhood passion when as a caddie he was given an old second-hand golf club. At the club where he was a caddie, he was allowed to play on Mondays. Despite his unorthodox golf grip, Sewgolum honed his technique and was soon acknowledged as an exceptional player. Sewgolum began to dream of playing professionally and finally made a brilliant debut as a professional in 1959 when he won the Dutch Open, which he won again in 1960 and 1963. Despite Sewgolum’s success, as a black golfer he was not allowed to play professionally in his own country. The golfing establishment regarded him with amusement and mild embarrassment, while to the apartheid officials he was a black trouble-maker, who should not have aspired to play golf professionally. For years Sewgolum was forced to pursue his game as an amateur in “non-European” tournaments. 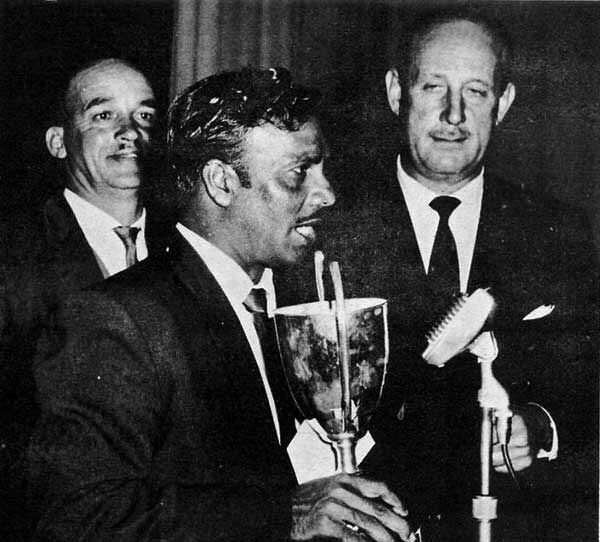 Under pressure, the authorities permitted Sewgolum to play in the Natal Open in 1963 at the famous Durban Country Club, after having been satisfied that apartheid laws would not be broken. “Suitable arrangements” were made for Sewgolum to use a mini-van as a change room, and to have his meals with the black caddies. Sewgolum did the seemingly impossible and won the tournament, and to the eternal disgrace and shame of both the white golfing fraternity and government officials, Sewgolum was not allowed to enter the Durban country club to receive his prize. A picture of a downcast Sewgolum standing in the rain being handed his trophy through an open window - while the rest of the golfers and officials were warmly ensconced in the clubhouse enjoying the post-game fare, outraged the world and gave impetus to the international movement to boycott apartheid sport. For inadvertently putting the bigoted state policy under the international spotlight, Sewgolum became a target of official harassment and machination. When he again won the Natal Open two years later, apartheid apparatchiks were determined not to make any “concessions” thereafter, and explicitly thwarted his chance of representing his own country in golf. Within a year of this victory, Sewgolum was banned by the South African government, and was not allowed to play in any tournaments or enter any golf course, not even as a spectator. Out of sheer malice the apartheid government withdrew his passport, thus closing off any possibility of competing internationally. In 1970, he was specifically banned from the Natal Open. In the ensuing years, denied the right to play the game he loved, Sewgolum was said to be a broken man, struggling to survive and staring forlornly at his golf trophies. He died a pauper in 1978, at the relatively young age of 48. This unassuming son of farm labourers, who could not read or write, dared to dream and succeed in the face of overwhelming adversity, which included a racist golfing establishment and - in a classic irony of apartheid logic – a government which actively undermined his accomplishments and outrageously humiliated and scorned him. Sewgolum still remains one of the greatest golfers to come out of South Africa. For his excellent achievements in the field of golf and his perseverance in the face of debilitating apartheid laws, the South African Government bestowed “Papwa” Sewsunker Sewgolum with the Order of Ikhamanga in Silver at the National Orders awards on 19 October 2004.